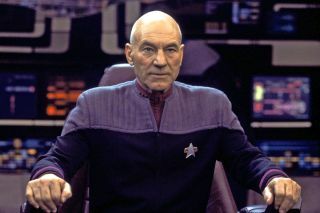 Actor Sir Patrick Stewart starred as Capt. Jean-Luc Picard in the "Star Trek: The Next Generation" television series and films. Captain Jean-Luc Picard rules. So says Jeff Bezos. The Blue Origin founder apparently sides firmly with Sir Patrick Stewart's portrayal of Picard from "Star Trek: The Next Generation" when picking the best starship captain from the "Star Trek" franchise. Of course, that may be because Bezos hung out with Stewart at a recent event. Bezos' bold decision sparked the inevitable debate on Twitter. Some Trek fans replied to his post to support the Picard decision, while others blasted Bezos for overlooking the obvious captain-y qualities of Capt. James T. Kirk (William Shatner) from the original "Star Trek" TV series and films. This isn't the first time Bezos has taken to social media to share his Trek fandom. In 2016, Bezos used Twitter to share what it was like to be a "Star Trek" alien, particularly what lunch was like when your face is encased in alien makeup. Bezos played an alien in "Star Trek Beyond," the third film in the rebooted "Star Trek" film series. While Bezos may admire Picard in the fictional "Star Trek" universe, the CEO's company Blue Origin is making steady progress on the real-life spaceships and rockets that it will launch into the final frontier. Blue Origin is building the reusable New Shepard rocket and capsule to launch passengers on suborbital trips to space, while also building a towering rocket called New Glenn for orbital flight. The company has built a rocket factory in Cape Canaveral, Florida, to build its New Glenn boosters and will launch them from a pad at the nearby Cape Canaveral Air Force Station. The first New Glenn launch is scheduled for 2020. Until then, live long and prosper, Jeff Bezos.